Marketing Darwinism: Clement, tell us about Quantarium. Clement: The company is inspired by insights from Quantum Physics and the potential inherent in applying them to Machine Learning approaches within an A.I. framework. We have organically gathered the analytical methods of fields as far reaching as Quantitative Genetics to build a leading Artificial Intelligence company that enables competitive advantage in vertical industries via advanced predictive and propensity models along with smart decision-engines. To be sure, there remains a lot for Quantarium to accomplish and indeed we have the ambition to match, though we are quite proud of our synthesis to date and the benefits our customers are enjoying each day. Marketing Darwinism: Can you tell us which verticals you focus on mostly? Clement: The beauty and peril of A.I. is that it can seemingly apply to everything and that can be intoxicating, thus both market and organizational focus to execute become paramount. Our first salvo is residential Real Estate, a $20 Trillion asset class that represents in a meaningful personal perspective, the most important of all sectors because it constitutes the largest purchase a family ever makes. Quantarium looks at Real Estate from a perspective not only of Data (and there is a lot of Data!) but also of modeling scenarios of what “could” be. For both financial institutions that “own” and service mortgages and for the individuals who own homes, understanding the “deep” economics is very important. From valuations to other analytical models, Quantarium intends to revolutionize the approach and economics. Marketing Darwinism: Clement, you have a background in large companies like Microsoft, how is it being a CEO of a start-up. Clement: Thanks for the question. There is nothing headier than building something with world-class people who humble me every day with their vigor and intelligence. At Microsoft, I learned how to manage A+ teams and to think about products and customers at scale. Applying that to the need for speed in the startup world is my biggest challenge and joy. Marketing Darwinism: Clement, I must ask you this. A.I. has become a “buzz phrase” …how do you distinguish yourself. Clement: You are certainly correct about that. The technology business is very much about fashion and phraseology. Unfortunately, it is also often about false claims as well. Quantarium’s founders team, with Ph.D’s and accomplished experts in the field, undertook the approach that A.I. is best when it enhances the ability for people to both arrive at a valuable truth in a quicker and more judicious fashion, and then start to predict future truths, or certainties, given the current business exigencies. 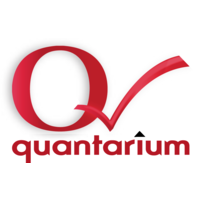 Quantarium established itself as an A.I. company from the get-go, it’s in our DNA; as a matter of fact, the first platform Quantarium built, QVM/Quantarium Valuation Model relied on M.L./A.I. technologies such as evolutionary programming when “Artificial Intelligence” was not such a buzz phrase yet. Our team consists not only of award winning Mathematicians and Engineers but also of some of the best “technology translators” in the industry. Algorithms and A.I. are indeed assets, however when you add them to the human agency and agility, you get real applications of real A.I. Marketing Darwinism: What’s in store for Quantarium in the next phase of your growth? Clement: Good question. While structured as a tridimensional growth approach, with a clear focus on increasing market share, innovation / differentiated I.P. and product expansion, in many ways we’ve been silent for too long. We enjoy genuine, solid relationships with our customers and partners but haven’t “splashed” in the market yet. That has been by design but the time has now come to shout from the rooftops. We’re showing up at conferences like the O’Reilly AI Summit and Strata. While we remain humble and true to ourselves, we are bold at the same time so watch out for us. Clement is Co-Founder and CEO of Quantarium, an Artificial Intelligence company enabling vertical industries via advanced Predictive and Analytic models, and smart decision-ing engines. As the name of the company suggests, inspired by Quantum Physics and fueled by the power and potential of Machine Learning such as synthesizing and leveraging approaches from Quantitative Genetics, towards resolving significant predictive challenges, Clement is an accomplished international professional for leveraging Data Science and A.I. as well as a proven business leader. With degrees in Computer Science, Clement spent 14 years building large-scale and Enterprise-level software products and services in areas traversing Content Management and Enterprise Search. Responsible for strategy and product development, Clement directed enterprise teams for Microsoft such as SharePoint, and MS Enterprise Search, while building a proven track-record for recruiting and developing teams with exceptional culture. Prior to Microsoft, Clement started and ran several software companies. Originally hailing from Romania, Clement lives in the Seattle-area with his wife and children. He is actively involved in a variety of philanthropies and applies philosophy to technology as he builds lasting companies.